This report is made focusing on the manufacturing finance officer’s point of view in Supply Chain Finance of British American Tobacco Bangladesh. Basically in order to complete my Internship program for Bachelors of Business Administration, I had a wonderful experience working for a period of three months in British American Tobacco Bangladesh. First part of this report is based on the introduction which includes topics like methodology and limitation of the study. Basically it defines the way and background of the study to prepare the report. The next part will include a glimpse of how multinational companies are, the history of British American Tobacco Bangladesh, its mission and vision, product offerings, competitors and distribution network and various departments followed by its operational network organogram. This report will also give a brief information about the different departments at BATB and also engage with the daily activities of working in Supply Chain finance department of British American Tobacco Bangladesh as a manufacturing finance officer followed by some recommendations and conclusion. Multinational companies are giant firms with their origin in one country, but their operations extending beyond the boundaries of that nation. For several years now, globalization has assumed a prominent place in the world. No matter where one looks, it seems, there is either a multinational corporation looking to expand into some new market. A corporation can be headquartered in one nation, run manufacturing operations in another, and ship its products conveniently and inexpensively to wherever its consumers might be. Multinational corporations will demand efficiency, punctuality and dedication, things which are deadly lacking in national life today. They will demand a certain work culture from the employees as well as the employers besides offering the best of goods and services to their clientele. Such is a multinational company named British American Tobacco. In 1972 as Bangladesh Tobacco Company (BTC), British American Tobacco Bangladesh was incorporated. British American Tobacco Bangladesh is one of the largest private sector enterprises in Bangladesh, incorporated under the Company’s Act 1913 on 2nd February 1972 and has been operating for over 100 years. Since 1972 BATB is operating as the market leader in the tobacco industry by providing some of the most powerful global and local brands. Beginning the journey as Imperial Tobacco 100 years ago, the company set up its first sales depot at Armanitola in Dhaka. After the partition of India in 1947, the company was established in 1949. After Bangladesh’s independence in 1971, it became Bangladesh Tobacco Company Limited. 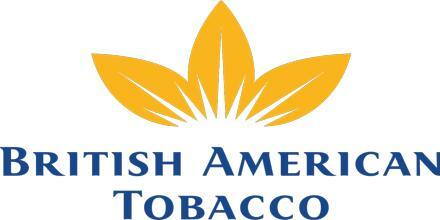 In 1998, the company changed its name and identity to British American Tobacco Bangladesh Company Ltd. It is listed on the stock index of the Dhaka Stock Exchange and Chittagong Stock Exchange. In its effort to create an international market for Bangladeshi leaf tobacco the Company has been exporting tobacco to markets in developed countries like UK, Germany, Poland, Russia and New Zealand. British American Tobacco Bangladesh’s motto is “success and responsibility go together”. The Vision of BATB is: “To extend our leadership through world-class performance”. The Mission of BATB is: ” Double the net revenue by 2015. Growing our share of the total tobacco market. Dominating key identified segments”. Premium: Benson & Hedges (B&H) launched in 1997, maintains its dominance in Premium segment and drives the growth of Premium price segment in Bangladesh market. Within a short time Bangladesh became a leading B&H market across the British American Tobacco world. BAT Bangladesh was the first market to launch the new pack of B&H at the beginning of September 2005. Medium: Star, launched 40 years ago, is still a dominant brand in this segment. Currently it is the highest volume generating brand for the Company. At the same time, the cigarette stick carried a new look with brighter paper and bi-color dye. Low: In order to meet the demand of the smokers of the increasing Low segment, they launched this Pilot, Hollywood. They consider their product segmentation for following their core competitors in Bangladesh. The competitive brands are given below according to the same segmentation. Low- Sheikh, Marise, K2, Five Star, Tope 10, Nasir Gold, Sun Moon. In May 2008, Philip Morris International launched both full flavored and light variants of Marlboro brand cigarettes in different markets of Dhaka. Dhaka Tobacco Industries is manufacturing and distributing the brand. BAT Bangladesh and Dhaka Tobacco Industries together hold more than 80% of the cigarette market share. Tobacco products are distributed either by manufacturers themselves, third party distributors or wholesalers. The company performs its sales and distribution operation all over the country through its five regional sales offices. They are located in Dhaka, Khulna, Chittagong, Sylhet and Rajshahi. Each of the regions is again divided into operational areas, each of which in turn is divided into territories. To perform its sales and distribution smoothly, the company operates 10 sales depots in different locations of the country and it has 63 authorized distributors. Moreover, BATB has 6 Regional Trade Marketing Offices (RTMOs), 12 Regional Sales Depots, 1 Factory, 1 Green Leaf Threshing Plant, 7 Leaf Depots and a Head office consisting of Corporate Head office and Production Head office. The Company’s Head office and Cigarette factory are located in Dhaka. A Green Leaf Threshing (GLT) Plant has been set up in Kushtia and it has started operation from April 1995. Furthermore, The Company’s products are manufactured in the factory at Mohakhali, Dhaka. BATB is a process-based organization, instead of having isolated departments the company has some support functions and some core functions. Typically the structure of the organization can be explained through the supply chain. The leaf department of BATB is responsible for Tobacco Growing, Production & Procurement, Green Leaf threshing and packaging, leaf bending, leaf export and import. BATB procures almost 80% of their leaf from their own cultivation. The tobacco crop is processed at the Green Leaf Threshing (GLT) plant in Kushtia. The purpose of the GLT is to convert the tobacco into a form suitable for cigarette production. The tobacco is brought to a uniform moisture level and temperature. Initial blending of the different grades of tobacco takes place at the GLT. The processed tobacco is sized and packed before delivery to Dhaka factory. The tobacco from the GLT comes to the Dhaka Factory for further processing according to needs. The first stage of production is known as PMD. The primary manufacturing department(PMD) is responsible for further conditioning the domestic tobacco to make it ready for production. The tobacco passes through a set of integrated and regulated machinery whose purpose is to blend the different packing grades in specified proportions. The secondary manufacturing department (SMD) uses the tobacco that is blended and conditioned by the PMD along with wrapping materials to manufacture cigarettes. British American Tobacco Bangladesh has a well-defined mission for the marketing and distribution of products, which is to reach the target consumer in the most efficient manner by becoming the benchmark supplier to the trade within the strategic channels in every market where the company operates. A well-organized trade marketing team is working continuously to make this mission successful. Furthermore the whole country has been divided into six regions to perform the marketing activities efficiently. Corporate Regulatory Affairs is the department which is responsible for upholding the corporate image of the company. Since BAT is in a controversial industry it is very much important for it to manage all its stakeholders as well as to manage the media. All these are done by CORA. It also looks after the legal aspects and taxation of BATB. From recruitment to selection and also from employee welfare to industrial relations, this department has to play an important role. IT departments function is to enhance BATB’s competitive position by increasing operational efficiency and timely decision making through measurably better and more compatible information system, and by harnessing the most appropriate technology and implementing new business practices to enhance BATB’s business effectiveness. The Finance department is responsible to evaluate the economic performance of the Organization in BATB. Operations covers the primary supply chain and Research & Development in BATB. 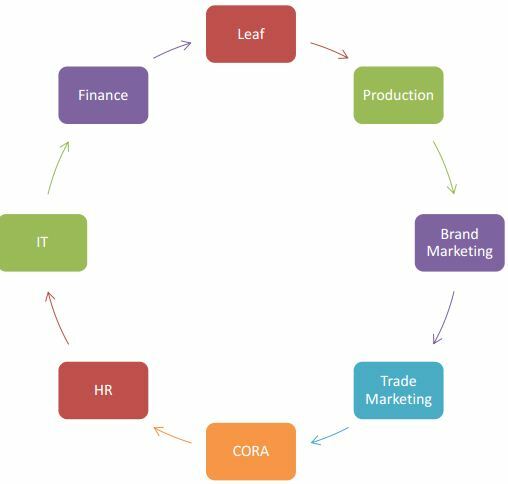 The primary supply chain is often described as the processes that cover the Plan, Product, Buy (including leaf), Make, Move and Sell/Service areas of the business in BATB. It extends from growing leaf in the field right the way through to delivery of the products to the first warehouse in the market. The vision of Operations in BATB is to be ‘Operationally best’. This means ensuring that products are best made, best delivered, at the best cost and in the best time. Products will not leave the factories until they meet the high levels of quality BAT and its consumers expect. This will create unrivalled products, and deliver the best smoke for its consumers. For Operations Finance, the vision is to be a proactive business partner within Operations whose commercial and leadership skills drive value creation across the whole supply chain. Operations Finance is at the forefront of developing cost effective and value adding capabilities across the Operations value chain at BAT. Management of waste levels within the factory is a core responsibility of the Operations top teams. Waste is measured in two ways: through leaf waste and wrapping materials waste. The causes of leaf waste within the production process are principally due to the many, sometimes aggressive, stages of manufacture, as during conversion of tobacco from large bales and cartons of green threshed leaf and stems, first into cut-tobacco blends (Primary process) and then into packed cigarettes (Secondary process) ready for distribution to the customer. As tobacco is an organic product with a natural content of water as well as a propensity to be subject to variations in structure and behavior throughout processing, it is inevitable that some level of waste will be generated. However, with good quality process, control, storage and handling it is possible to minimize losses, but in order to measure, understand and benchmark performance in this area we need to apply a consistent and well understood method of waste calculation. We download an excel file from SAP and organize and enter data and send it to Primary manufacturing department and they calculate the leaf wastage. Measuring wrapping materials waste is to measure the waste incurred in converting materials (tow, cigarette paper, hinge lids, film etc) into cigarettes. As a manufacturing finance officer we had to download SAP dumps arrange the data in excel using various functions like vlookup, pivot table, etc and calculate wrapping material wastage according to an excel template. I also had to prepare a capital expenditure tracking file, which would be needed to be updated thrice or more weekly. CAPEX investment is an enabler to achieve productivity improvements in the manufacturing process, to address factory footprint initiatives, to increase a plant’s capacity (growth), to deliver product innovation allowing the development and deployment of strategic projects, and to keep operations running. BAT looks at CAPEX within the three categories that add to net CAPEX. The first category is to show the gross external investments (purchases from third parties); the second category is internal investment (i.e. assets bought from other BAT companies); and the final category is sales of fixed assets to effectively manage the net CAPEX impact on cash flow. As a manufacturing finance officer we also had to do stock reconciliations. The stocks reconciliations would be for Leaf, Wrapping Material, Primary Manufacturing Department, Filter Rod Department and R&Rs departments. During the month end the physical stock of these departments would be counted by an external auditor along with a BAT employee. Those will be then compared with the stock amounts present in the computer system. We have to download excel dumps from SAP and find out any discrepancy between the physical quantity and system quantity. If there is any discrepancy we would have to go to respective departments to find out the reasons for these discrepancy and we would calculate the total amount of discrepancy value in BDT. Stock reconciliations are needed to ensure that replacement items are ordered in a timely manner, that inventory is properly valued, and that parts are available for sale or production when needed. Stock reconciliation is also needed to ensure that the actual and recorded stock amounts are the same at the end of the year, so that there will be no issues when the stocks are audited. When the difference between the physical quantity of the stock and the recorded quantity of the stock in SAP cannot be corrected with an adjustment, stocks need to be recounted. It is entirely possible that someone incorrectly counted the inventory. If so, a different person needs to count it again and inform. The units of measure should be the same. For example it may be counted in kg but recorded in system as liters. Due to missing paperwork a huge source of inventory reconciliation issues may occur. The unit count in the stocks records may be incorrect because a transaction may have occurred, but no one has logged it yet. Arranging and attending Manufacturing Top Team Meetings was another activity which I had to do once a month. This would include room booking for meetings, notifying those who would attend the meetings by email and conforming by phone. The agendas of the meeting would need to be prepared and updates regarding previous month’s meetings would be collected. There managers of different departments in supply chain finance would discuss about their findings in the month and the issues that were being faced would be tackled with action plans for them or their respective departments. In supply chain finance manufacturing meetings the departments would be sharing their input regarding budget variance, manufacturing logistics, environmental health and safety issues, primary manufacturing department, secondary manufacturing department update, production engineering, manufacturing human resource and any other business related issues. The action plans that would be discussed during the meetings would then taken as minutes by myself and later be circulated to all these departments through lotus notes which is the email client in British American Tobacco. Tax stamp reporting was another activity as a manufacturing finance officer. A tax stamp is any adhesive stamp, metered stamp, heat transfer stamp, or other form or evidence of payment of a cigarette tax. Tax verification is essential for governments to know the volume of products manufactured, so as to determine the excise tax due and/or paid. Digital tax verification is an enhanced tax collection method that uses advanced digital coding technology printed directly onto packs as a tax stamp. My job was to download monthly reports from system, organize them, analyze the data, see production of tax stamps and calculate wastage of stamps in excel using formulas preset in a template for various packets. After calculating the wastage, the reported wastage would be mailed to the tax office so that tax stamps can be ordered for the next month. Month end was another activity for supply chain finance department which needed to be done on the last day of the month. It is part of the company’s closing operations. Month end close is performed to finalize a snap shot of transactional activity for a period. Most processes run at month end are also run on a daily and/or weekly basis. For month end, these processes are performed for the last time for a particular month to ensure that all transactions are posted and reflected on reports. The month is officially closed when all of the month end processes are complete. Before 3 or 4 days of the end of every month we would have to inform auditors for the physical stock they would need to count on the last day of the month. They would be informed over email and followed up through a telephone conversation. For British American Tobacco Bangladesh, the stock count would usually be done by a group of auditors from Snehasish Mahmud & Co.(SMAC). The stock count would begin at different preset times. The material go-down stocks would be counted first usually at 8 pm by an auditor from SMAC along with a BATB representative who would count separately along with him so that counting errors are minimized. The physical stocks of filter rod department and primary manufacturing department would then be counted by the auditors. The process usually lasts till 11pm. After that the auditors would submit their reports and input would be given in the system. We needed to download dumps from SAP every few minutes to see whether confirmed quantity matched with delivered quantity that is there in the factory. If it did, then we would carry out the calculation of wrapping material wastage and leaf wastage. We would exit our offices in the morning at 7 am or later depending on how smoothly the month end would go. Apart from all these tasks, I would have to assist my line manager and any other departments when they would need information. The training phase for any new contractual provided British American Tobacco Bangladesh could have been more structured and descriptive. There could have been structured and detailed written down steps for completing specific tasks. Despite being a top-notch company, the computers used at British American Tobacco Bangladesh are a bit backdated, that is mostly corei5s instead of corei7s are used. As a result, working with huge excel files often make it far from a smooth experience. The network speeds could also have been improved since it does take some time to load SAP. For the supply chain department no internet is present and only intranet is used which makes it difficult for many to look up for solutions on the internet when they face an issue. Hence, internet should be present but monitoring data is also essential to prevent any leakage of confidential information. British American Tobacco, being one of the leading tobacco companies of the world ensures value addition at every stage of the supply chain. BAT must further focus on price, quality and performance of their product lines and brands to stay competitive in the industry. Even though people are becoming more aware of the health hazards of smoking, customers who smoke on a regular basis face enormous difficulty in giving up. British American Tobacco should contribute extensively on research and development for better variety of tobacco leaves that will be less injurious for health and more cost effective for the customers. I believe, British American Tobacco will continue its trend of being one of the leading MNCs in Bangladesh by continuously driving its growth year after year.